Scheduled to make its debut at 2015 Goodwood Revival, the newly released Caterham Superlight Twenty 2016 has already made its way into the UK market. The limited-edition model is a race-spec creation from the house of Caterham, built to celebrate a sports car from 1990 and is a spiritual successor to Superlight 1.6. 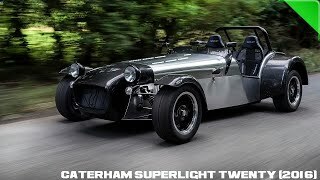 Let us have a look at the review of Caterham Superlight Twenty 2016 to know more about the model. As we said it is created to celebrate the original Superlight 1.6’s, the interior of Caterham Superlight Twenty 2016 further pictures the same. However to give it a touch of era, the plain dashboard gets a unique instrument cluster accompanied by the usual gauges and switches. The titanium-resembling colored floor joins the commendable cabin scenario with the ‘Superlight Twenty’ motif over the gear knob. As we mentioned this is a limited edition model, the passenger side of dashboard gets adorned with metal plate. Each model is numbered between 1 to 20 and feature ‘Superlight Twenty’ lettering. Rear seats are made from carbon-fiber and get some extra essence through embroidery. 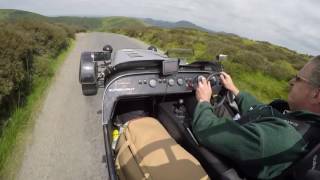 In all the interior of Caterham Superlight Twenty 2016 is created from classy materials and is a remarkable blend of then and now. We must say, that to us exterior of Caterham Superlight Twenty 2016 looked an aggressive work of engineering and design. The track-focused model comes drenched in carbon-fiber. The material has been intensely used in creating front cycle wings, nose, rear fenders, mirror caps and aero screen while the body gets its finishing through bare aluminum. Thus rounding up the exterior details of Caterham Superlight Twenty 2016 we would say, it has been created to perform best on tracks. 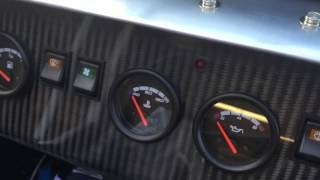 Beneath the hood of Caterham Superlight Twenty 2016 is a 1.6 Liter Ford Sigma engine cranking total output of 135 hp and peak torque of 165 nm. With this power rolling this race-spec model, top speed of Caterham Superlight Twenty 2016 touches the mark of 122 mph and can sprint from 0-60 mph in 4.9 seconds.